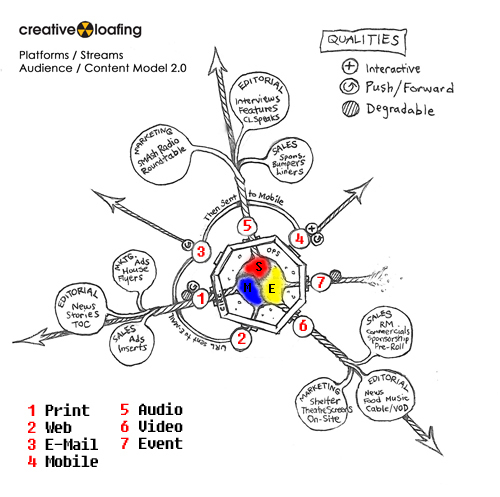 Here is the 2.0 3.0 model we’re using at Creative Loafing to visualize, produce and deliver our content through seven very real, very distinct, very monetizable platforms. It will continue to change and adapt over time to fit new media, new content and new audiences – but for now, this is what we’re dealing with. B. Content flows in streams. These can be adapted to any industry (music, etc.) but in this model are for the purposes of the publishing industry and are labeled sales (red), editorial (yellow) and marketing (blue). Since these departments typically create or drive content together, these streams are depicted as “braided” or flowing simultaneously. 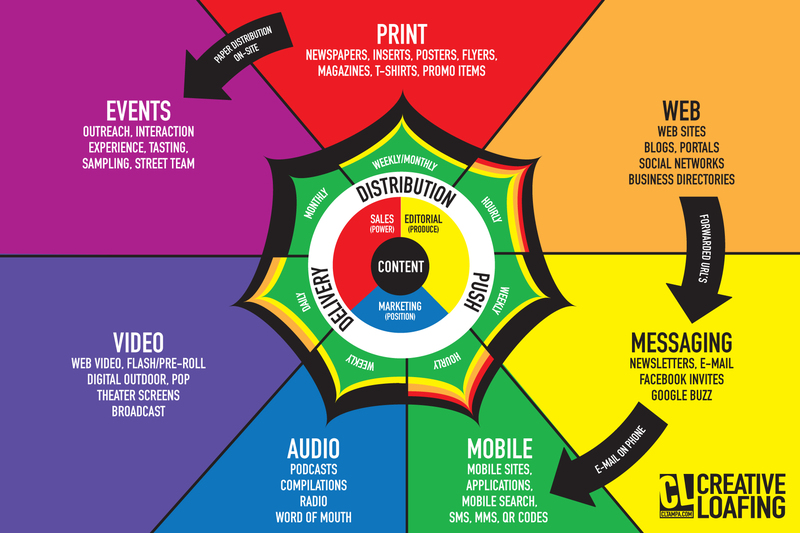 (The publishing model also allows for Operations and Circulation – two departments that support content delivery, but that typically do not create it). D. The platforms (or portals) themselves are not mutually exclusive. Audio content can be a podcast, but it can also be word of mouth. Video can be an individually-viewed YouTube clip or a digital billboard in full view of everyone. Content can (and should) be delivered through more than one platform at a time. Content can also be a multi-platform experience such as a Web site (2) forwarded to you via e-mail (3) and then viewed via the mobile Web (4) (see illustration), or printed material (1) handed to you at an event (7). E. All platforms represent outbound delivery and are not directly related to (or limited to) sense receptors of any one end-user. The audience interacts with content based on increasingly varying combinations of devices, touchpoints and relevance. A printed artifact can engage the sense of touch, sight and even smell. Video affects sight and hearing (and now, with the advent of tablets – touch). Event-based content typically takes advantage of all the user’s senses for a given length of time. Note: The platforms and the qualities of the streams should not be confused with “user experience.” End-user experience should be measured using the Medill study here. P(3) = Editorial produces the content, sales powers the content, and marketing positions it. 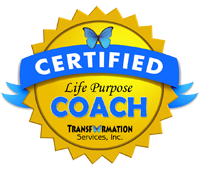 *In biological terms, consider the sales/advertising elements as the power stores that will create the energy within the cell or system to drive and deliver (or propagate) content outward. It is the job of the combined streams (the nucleus of editorial, sales and marketing) to maintain that the content, brand identity or message (DNA) is properly replicated. Information as an organism. it’s alive, it’s moving quickly, and we can only hope to consolidate, contain, and deliver it. Your visualization model is nice. It helps me….you know….visualize it. Good work. Yes sir, convergence of the audio-visual mediums with all ultimately feeding into & supporting a central message or theme (or in the hands of a corporation; a product) is where it all seems to be moving. I’d like to see as much of the delivery as possible stay in the context of live interactions between real human beings in three dimensional spaces.. The Networked computers & attention-hungry electronics are continuing to dissolve real relationships. I have a theory about this that is now becoming a fourth book. So now I have a tetralogy rather than a trilogy. We live in interesting times. As Jim Morrison said “This is the strangest life I’ve ever known.” Yea it is.